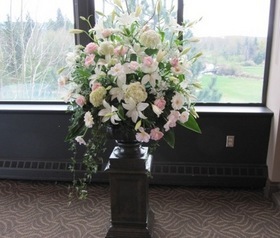 Combination of flowers on brown urn and pedestal. Description:Urn and pedestals are included for rental. Combination of Hydrangeas, Roses and Lilies with greenery and branches. Sold per set of one urn, one pedestal and one floral piece.